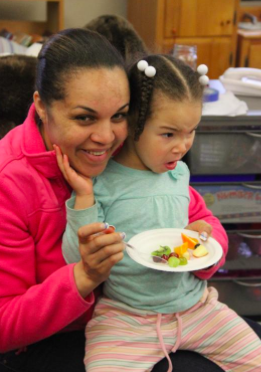 During the March workshop at St. Paul’s Church in Pawtucket, preschoolers took the lead by taste-testing a variety of vegetables, local apples and dried fruits in shared class time with their parents. They also explored edible seeds and grew pea shoots, while parents learned (in English and Spanish) about nutrition and the importance of a varied diet that includes fresh fruits and vegetables. Parents also shared tips with each other on introducing vegetables into young children’s diets. In May parents will be able to participate in an English language learner version of our Beginning Organic Growers series as a part of their ELL program.